Update: Gratipay is dead. Long live Liberapay! On May 11, 2012, I was sitting in a coffee shop wishing I could work full-time on my open source projects. A lightbulb went off, and three weeks later I launched Gittip, a “tip jar for GitHub” (renamed two years later). The years since have seen all kinds of twists and turns, highs and lows. From an initial constituency of open source developers, our user base expanded to include tech diversity activists. The combination fueled exciting growth, until personality clashes boiled over into the Gittip Crisis. From there, provocateurs continued to take advantage of Gratipay’s overly welcoming nature, until we had to admit that yes, online communities really do require moderation. As luck would have it, we issued our first two user bans right as our close partner Balanced Payments went out of business. That quickly escalated into the Gratipocalypse, resulting in Gratipay 2.0 and a fork, Liberapay. 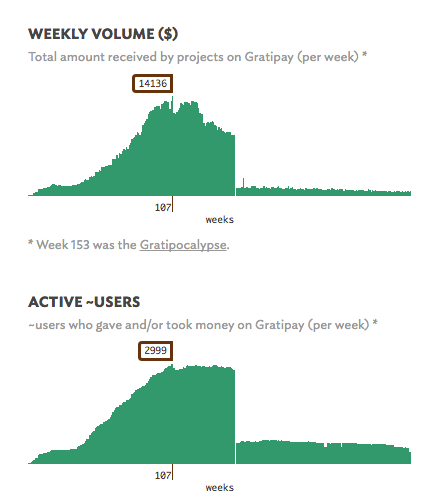 Gratipay has continued to process payments in the two and a half years since, but at a much-reduced level. Meanwhile, the problem of funding people to work full time on their open source projects has only gained greater urgency. Heartbleed led to headlines and the creation of the Core Infrastructure Initiative. Last year’s Roads and Bridges report led to this year’s Sustain conference. And now we’re out of runway. We intend to continue processing existing weekly payments through the end of the year, which puts the last weekly payment cycle on December 28, 2017. If you are currently receiving payments through Gratipay, thank you for your patronage. I’m sorry for the inconvenience of shutting down, for the loss of income this represents for you. I’m sorry that we couldn’t make this work. Fortunately, there are great alternatives in the market now, such as Patreon, Liberapay, and Open Collective. If we can do anything to help you move to another platform, please get in touch. On December 29, 2017, we plan to switch gratipay.com to a static web page. Since it will likely take years to dispose of unclaimed balances in the proper legal way, it may be a while before we can fully delete our database. I’m proud of and humbled by what the Gratipay community has accomplished over the past five and a half years. We moved $1.1 million from dozens of companies to hundreds of open source projects. We pioneered what it means to be an open organization. We tasted the future of work, even if Gratipay won’t be how we get there. We conducted a valuable experiment in cultivating an economy of gratitude, generosity, and love. I’m sorry for the mistakes I made. I’m grateful for all of you, and I wish you all the best. Gratitude? Gratipay! The easiest way for companies to invest in open source.